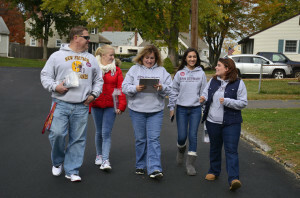 NEW BRITAIN — Mayor Erin Stewart was busy on the campaign trail on Saturday, aiming to reach about 3,000 likely voters. “A lot of people are intimidated by city hall, and our goal from the beginning has been to bring the government to the people,” Stewart said as she took a break from her “Super Saturday” responsibilities to join Daniel Salerno, alderman at large, for one of his Coffee for Open Government events at Paradise Pizza Restaurant. During Super Saturday, Stewart’s team intended on calling 2,000 likely voters in the upcoming Nov. 3 election and knocking on the doors of another 1,000. “It’s important to identify what issues people are having and hear about how they impact them,” she said. According to Justin Dorsey, Stewart’s campaign manager, about 10 groups of volunteers were out on Saturday knocking on people’s doors, and there were another half-dozen working the phones back at the Republican Headquarters. “We want to get out message out to people.” Stewart said. One great example of that, the mayor said, comes from participating in Salerno’s coffee discussions. Another message Stewart wanted to get out to voters is her commitment to progress, which sometimes means working with someone from the opposite party. The people of New Britain, she continued, are unique in that approach. For example, the mayor explained, Republicans in New Britain are outnumbered by a 6-1 ratio. But residents seem to care more about their connection with candidates than their political party, Stewart said. Stewart is running in the Nov. 3 mayoral election against Democratic candidate John McNamara and petitioning candidate Alfred Mayo.